Like I stated a good quarter. My problem is even with reading over a book a day my to be read pile is always growing faster than I can read. It was by no way easy to narrow these down to a top ten list for fiction and non-fiction. But this is what I managed to come up with. 5. Daniel A. Lord S.J. I have read extensively on Saint Josemaria Escriva but far less on Blessed Alvara del Portillo. This booklet is the start of that lack of knowledge changing. I was amazed at the life this man lived, and so much of it I was completely unaware of. 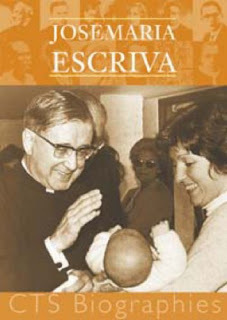 I began my research into Escriva and Opus Dei when I was a religious studies major in university. I started my research with the intent of a doing a thesis on the work. I started attending monthly recollections, and making retreats most years. The people I have known who are part of the work have inspired, challenged and encouraged me going on 30 years now. And this booklet has done the same things. 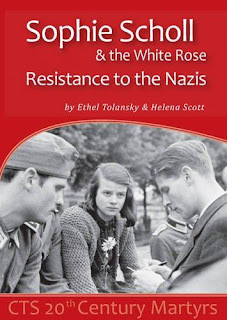 I am already looking forward to rereading this book with my children over the summer holidays. 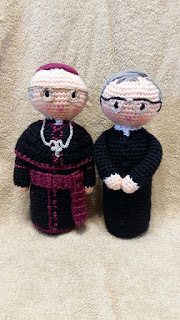 My youngest two have crocheted versions of Saint Josemaria Escriva and Blessed Alvara del Portillo made by Oremus Crocheted Saints. And I know that they will love this booklet as much as I have. "One day in the early 1980s a young man was praying in front of the statue of Our Lady in the Cathedral of Notre Dame in Paris. His name was Louis and he was from Cameroon. While he was there a white-haired priest came up to him and introduced himself, and they were soon deep in conversation. 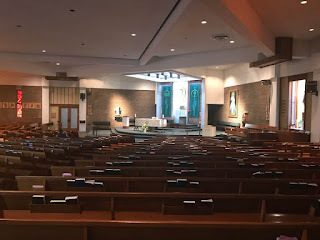 Louis was very struck by this fatherly-looking priest, with a gentle smile and understanding eyes, who spoke with such faith, warmth, priestly zeal and love for Jesus Christ. After they had both returned to their respective countries, they kept in touch by letter, and Louis discovered his own vocation to the priesthood. He entered the seminary and was ordained in 1989. Referring to that encounter, Father Louis said later: "This is my model, this is the priest I would like to imitate!" 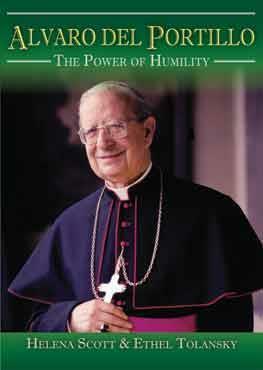 The priest who had inspired him, and continues to do so, along his path in the priesthood, was Alvaro del Portillo." And that is what we will come away with after reading this book, it will be an encounter with a saintly man who will inspire us! And it is a blessing to have this book as so much that has been written about and by Alvaro del Portillo is not available in English. Making this a little treasure for us to cherish. 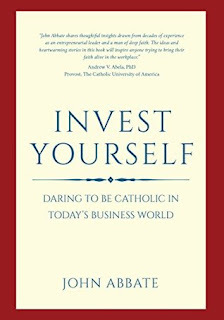 This book is another excellent read from The Catholic Truth Society. They currently have over 600 title in print, and just over 300 available electronically. Every time I read a book from CTS I find 2 or 3 more I want to read. While working on this review I found out the authors Helena Scott and Ethel Tolansky have co-authored three other biographies for CTS. 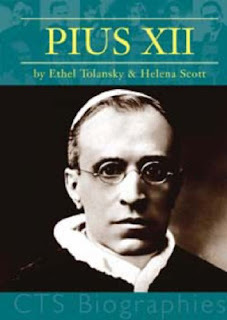 I had not encountered Tolansky before, but have encountered Helena Scott as the translator into English of some of the works by Father Jacques Philippe. I have already added their 3 others CTS books to my wish list. This book is an excellent read and strongly encourage you give it a read. In the last 6 years I have read 40 books with the Moody’s. From the Judy moody Series, The Stink Series, The Judy and Stink books, and most recently the Judy Moody and Friend’s series. I started reading these books before I had kids, and now read them with my three children ages 11, 10 and 7. The Moody books are family favorites and we always look forward to a new book in any of the four series, and this book was another great read! I have yet to read anything by either McDonald or Reynolds that was not a great read. And tis book, these series are great for kids to read or to read with kids. 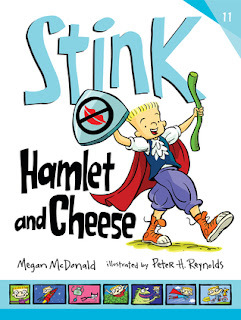 We are at the point that my oldest two can read the Stink books by themselves or to the youngest. Or like this one we can take turns reading pages and worked through the book on a rainy afternoon. This book is a big change for Stink. He has a girl interested in him. Stink and one of his best friends Sophie are at a camp called Shakespeare Sprite during spring break. When Stink gets there the first day he is the only boy. And Riley Rottenberger has promised him that he will get a great big kiss before the end of the week at camp. For the most part camp is fun, they learn Shakespeare insults, sword play and stage fighting. By the end of the week they will each get to be in a scene and their parents and friends can come. Stink’s fear of the kiss and the shenanigans surrounding that add some fun to the story. Both his sister Judy and Sophie help his make a shield to fend off the dreaded Rottenberger. They go to a community production of the cursed play, and Stink says the ‘M’ word several times. Reading this book raised a lot of questions about Shakespeare. It is great to get younger children interested in the story. My kids immediately made the connection to Gnomeo and Juliette. And asked if any other movies or plays were appropriate. And living not far from Stratford Ontario and one of the largest Shakespeare festivals in the world helps draw their interest even more. This book would be a fun read for young fans of drama or children who like to put on performances (my girls). My son loved the stage fighting and sword play lessons in the book. 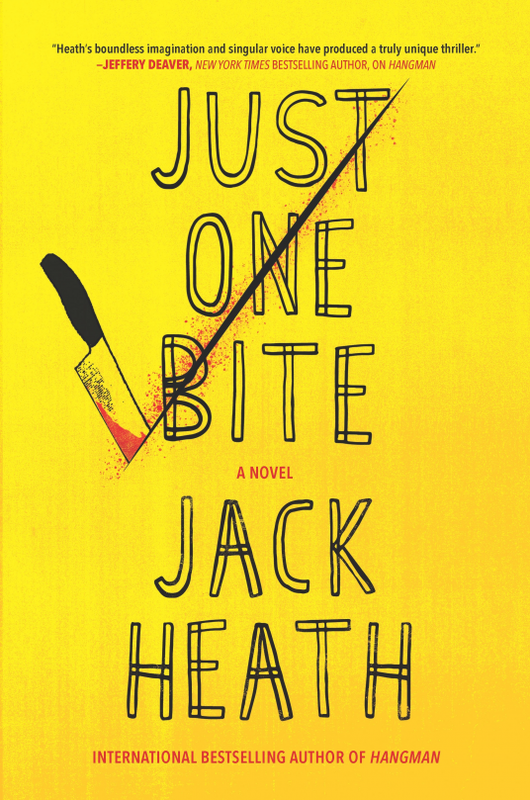 For fans of the Stink books it is a great addition to the series. The book is entertaining for children and for those of us who read to or with them. 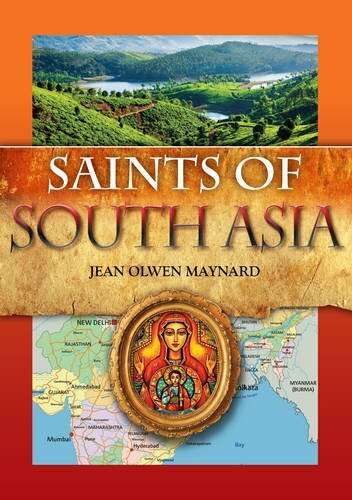 "Such a short booklet can be no more than an introduction to the saints of North America. If it's caught your interest, do try to find out more. It's necessarily had to be selective, and not everyone will agree with the selection. It wasn't possible even to include all the canonised and beatified figures - among them St John Neumann's curate, Fr Francis Seelos, who was beatified in 2000, or Fr Stanley Rother, the Oklahoma farm boy martyred in Guatemala in 1981, whose beatification is expected in 2017 - or so much as look at the saints of Mexico. The full list of people who were important for the Catholic history of the US and Canada, and for whom causes have been opened or proposed, is long and fascinating: it includes Frs Eusebio Kino and Fr Frederic Baraga, who've been mentioned here, but it also includes Dorothy Day and Fulton Sheen (on whom CTS booklets are available); Fr Augustine Tolton, the first black US priest; Sr Blandina Segale, who took on Billy the Kid; Catherine de Hueck Doherty; Georges and Pauline Vanier; and many, many more." And Jean is correct, this little volume could not possible capture all the saints, blessed and venerable of North America. To be honest no single book can, an entire encyclopedia would be needed to do just ice to all the holy men and women who are from North America or who served there. But this book does do an amazing job to give a cross section of men and women who served and of many who gave their life for service to Christ. This book is a great little read. You will encounter so many fascinating saints, and amazing stories. I doubt you could read this book and not pick one or two or a few saints to learn more about. 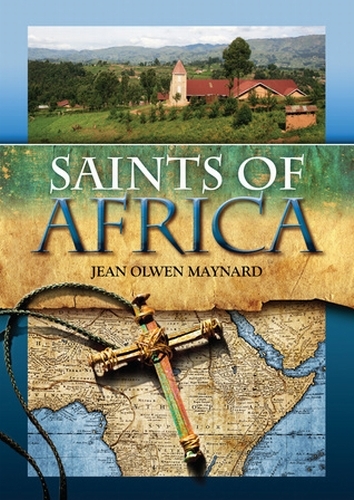 This book breaks using geographic and time as a way to group these saints. 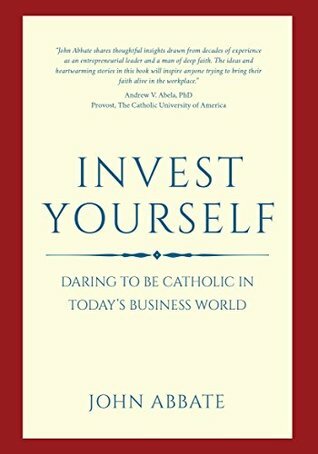 Living in Canada and having gone to Catholic School I was surprised by how many saints in this book I was unaware of. I was familiar with a few saints in this booklet. I had previously read books or 4 or 4 of the saints. A few I was aware of, my almost half of the saints I have not encountered before. Jean Olwen Maynard has written a wonderful book. As soon as I had finished it I picked up a couple more by her to add to my to be read pile. It is written in a very engaging manner, I found it hard to put this book down, and yet because of the size it can easily be read in a single afternoon or over a few days. Maynard presents the saints is such an engaging manner that it is like sitting and chatting about old friend. Reading this is a way to catch up with what God was doing in North America during the early years. An excellent read I highly recommend. I need to start by saying that I enjoyed this book. But I believe that some people will give up on it, or not engage because the examples so often come from McDonald's. John Abbate is an owner operator who has spent years investing in his business, and the people who work for him. There are some incredible stories in this book. So please if you give it a change I am sure you will be challenged, and inspired by this volume. And my favourite book on the topic is from a few years back by Kevin Lowry called: 'Faith at Work: Finding Purpose Beyond the Paycheck' This book is a good read and really does approach it from a different perspective. This book was on my radar for a while. But because I had already picked up and read the two books above I hesitated investing in a third book on the same topic in such a short time. And yet I kept encountering this book, on Facebook, on twitter, and even a few friends mentioning it. So I decided to give it a chance. I am very thankful that I did. From "Me First" to "Daring to Be the First"
Pilgrimage: Who Do You Say That I Am? 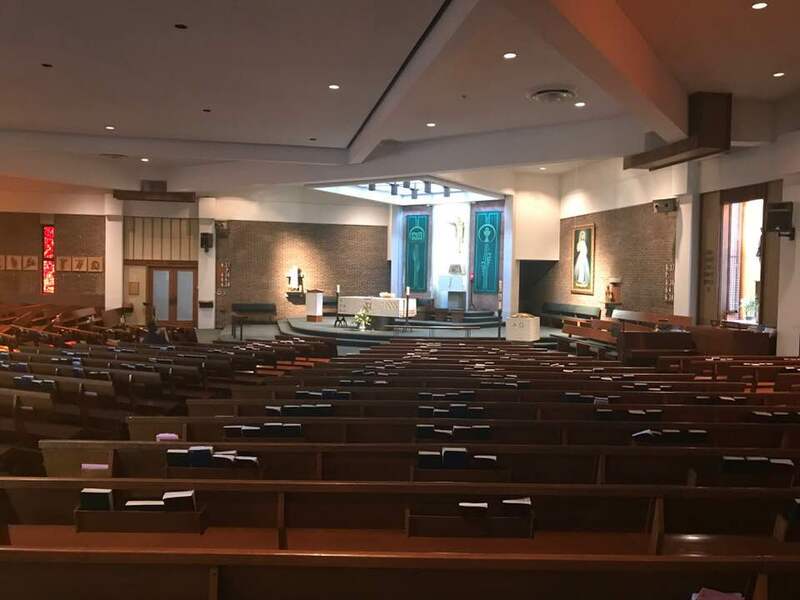 "My experiences with Catholic conferences, pilgrimages, and professional business organizations such as Legatus have opened my eyes to the abundance of talented and faithful men and women who are willing and able to carry on the mission of the Church. These heroic people are the future of this great faith. Their enthusiasm, sacrifice, and talent are infectious." "We have all received an abundant inheritance from our forefathers. We stand on the shoulders of so many resilient and courageous figures of our past. Today we must choose to be the link that keeps our Catholic history alive in our families, our communities, and our culture. When we choose to learn about and share our own family history and embrace the richness of the tradition of our Catholic faith, we become the instrument that continues the mission of Matthew 28. We spread the Good News to all corners of the world." John talks about his own failings in an open, honest and vulnerable way. He takes us through his own journey from being a business man, to his encounter with God in a new way, to being a Christian in business. 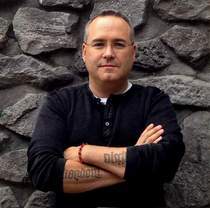 He shares with us stories about working with his team members through difficult times. And he shares about what being an owner does in allowing him to give more flexibility and support to his people. Nearly every business these days talks about employee engagement. John walks us through how his faith changed his management style and how employee's became the purpose and not the process. It is a great read and I highly recommend it. And if you do enjoy it I am sure will be engaged with the others listed above. I have been fascinated by Father Damen now Saint Damien since encountering his story while on retreat with Michael W. Higgins, who was using hos book 'Stalking the Holy' for a series of talks about saints. Wile on the retreat we watched the movie Molokai: The Story of Father Damien, and I have been addicted to books and movies about Damien even since. 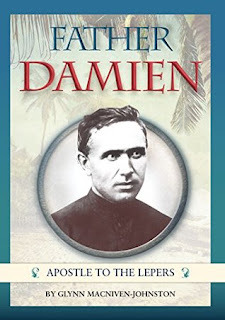 Abd this is an excellent little read on Saint Damien. 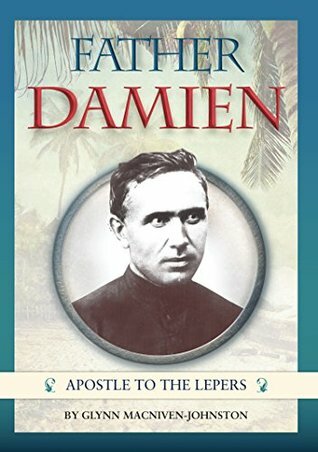 This book has two different sub titles, the title of the eBook is 'Father Damien Apostle to the Lepers' and the physical booklet has 'Father Damien de Veuster Apostle to the Lepers'. But not matter which version you read it is an excellent book. 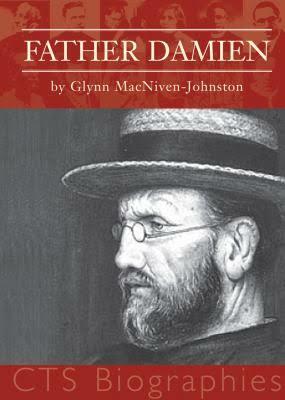 With everything I had read and watched about father Damien prior to this book there was still new information I learned. Some of it was about his canonization process, and some of it about his life, times, and legacy. I was unaware that Mother Teresa of Calcutta wrote to Pope John Paul II on May 7th 1984 lobbying for the canonization of Father Damien to be the patron saint to lean and protect those who serve lepers today. Damien was a man dissuaded after in life. He was encouraged not to pursue a religious vocation. Once he was accepted he was told he would not be a priest, but a brother instead. He was denied the chance to go on missions, and then he filled his brother's shoes for the mission field when his brother was already commissioned but became ill and could not travel. He was originally discouraged from his ministry and service to the lepers. He was told not to come back to the main island, and he was told to stop asking for more. But he always asked to give to others. The novena at the end of the book is from the Congregation of the Sacred Hearts of Jesus and Mary in Leuven. And to be honest the book is worth owning just for this novena. 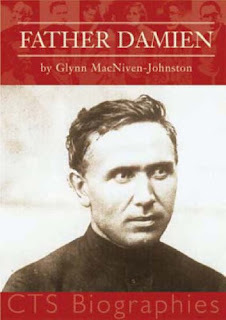 If you already have a devotion to Saint Damien this book will be a great read, and if you are not familiar with him, please do your self a service and read about his inspired service. The first edition of this book was published in 2009. 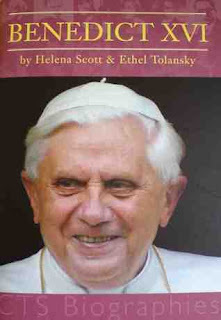 A new edition of the print book was released in 2009, it was updated at this time with information on his impending canonization. And the eBook was released in 2017. Coming in at just under 75 pages this book is a quick read, but because of the content is not easy. The book would be accessible to tweens, teens and adult readers. It Can be read alone to help us understand more about this great saint, or be a jumping off point into studies about the man, his life, his work, and the service on Molokai by him and many others. 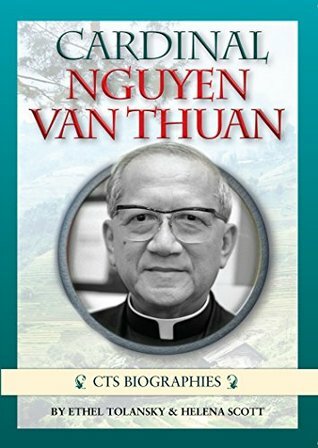 This is an excellent biography and I highly recommend it! This weekend there are two optional liturgies. On Saturday evening it can be the Vigil mass, and then on Sunday the Feast on the day of. There are two sets of readings, but they echo the same messages. As I write this I am home with a very sick little boy. It started earlier in the week with his little sister. She was not feeling well Monday or Tuesday Evening, and Wednesday stayed home from school with a fever. Thursday I was home sick, and Friday I worked from home because I still had the fever and other symptoms. And now on Saturday morning, my little guy is home sick, and he seems to have been hit the hardest. We found out that 6 of 19 kids in our youngest’s grade 2 class were out sick this week. The beginning of summer if a terrible time for the flu. But we can comfort and support each other. Yet even with a week of illness we have much to be thankful for. And for this week's reflection I will focus on the two Responsorial Psalms. R. From My mother’s womb, you have been my strength. Rescue me, O my God, from the hand of the wicked. from my mother’s womb you have been my strength. of your deeds of salvation all day long. O Lord, you have searched me and know me. There is a lot that can be unpacked from those15 versus. I admit I have struggled in life. Emotional struggles, monetary struggles. And some awful messy stuff in my past, from my youth into my early 30’s. But God has always been faithful. God has known me and welcomed me every time I came home. I had a grandmother who thought I would be come a priest, she prayed for me a lot. And even though she was not Catholic, she would take us to mass, or to whichever United or Anglican church she was attending at the time. 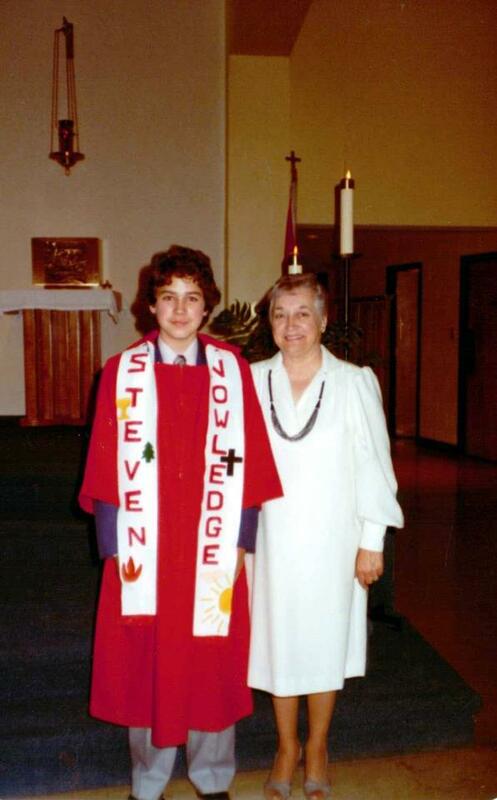 This photo is of Grandma and I at my confirmation I believe in 1984. At the time I chose the gift of Knowledge. There are many times I have looked back on my life and wished I had chosen Wisdom instead. My oldest has started her confirmation preparation, and they must choose a saint that does not match their name. Things have changed. But God has stayed the same. God has been my deliverer, my rock, my refuge. I have been blessed so many ways in life. I will continue to trust god through this phase in life and follow his leadings. I challenge you to go back and reread the two scripture sections above. Read them slowly, read them and let them sink into your heart, into your mind, and into your spirit. No matter how hard things are now, we have a God we can trust in. And next week is the Feast of Saint Peter and Paul, Apostles, again we have two sets of readings for a vigil and a day of mass. Until then know that I am praying for you my friends, family, and readers, and I ask you to be praying for my family and me. I have encountered many Australian authors who became instant favorites. My first expectations were exceeded, and I tracked down all they had available in North America to read. Authors such as Sally Murphy, Scot Gardner, Marianne de Pierres, to name nut a few. But that was not the case this time. Maybe my expectations were too high. Maybe the hype and waiting for the book to be available in North America inflated what I was expecting. 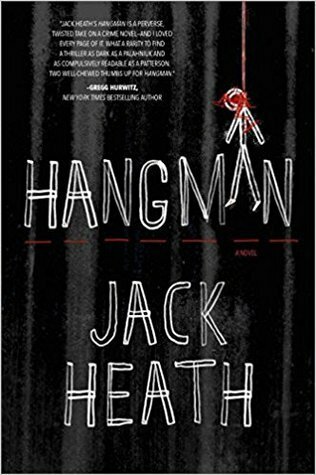 As a huge fan of both the TV series Dexter, and the I Hunt Killers books by Barry Lyga, I was expecting something exceptional from this book. 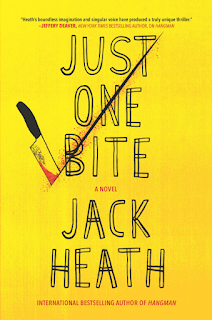 What it feels like is some Chuck Palahniuk, Tom Clancy, and Irvine Welsh tossed in a blended and slopped together. The premise of the story is that the FBI have a n ace up their sleeve. 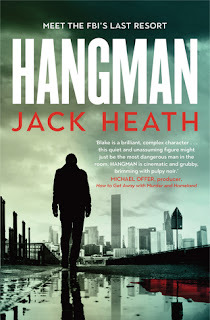 Consultant Timothy Blake, codename Hangman. Blake is a genius, with perfect memory and recall. He solves impossible cases. But he is also a sociopath and a cannibal. His payment for every life he saves he gets to take one. 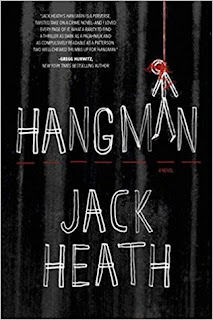 Some books you read, and you need to suspend disbelief. Some you need to toss it out the window. This one you need to jettison it into the sun or a black whole. The characters feel at times week in the writing. The story and premise if intriguing it just really fell flat on the execution. This book likely would have ended up on my 'not finished' pile but I kept expecting it to turn that corner from ok into good or even great. It just never quite made it. I do not regret finishing the read, but only just. It takes a lot to turn my stomach, not even the once chip challenge managed it, but this book came very close. The story was good enough that I would be willing to try others by the author. But I can only think of one or two friends or acquaintances who would actually appreciate this read. But this book is going to be very acquired taste. It will definitely leave you with some thoughts to chew on. Chew right down to the bone.